This post is sponsored by Gama Sonic, but all opinions are my own. Read my full disclosure policy here. You don’t need to spend a fortune or hire a professional to install outdoor landscape lighting. 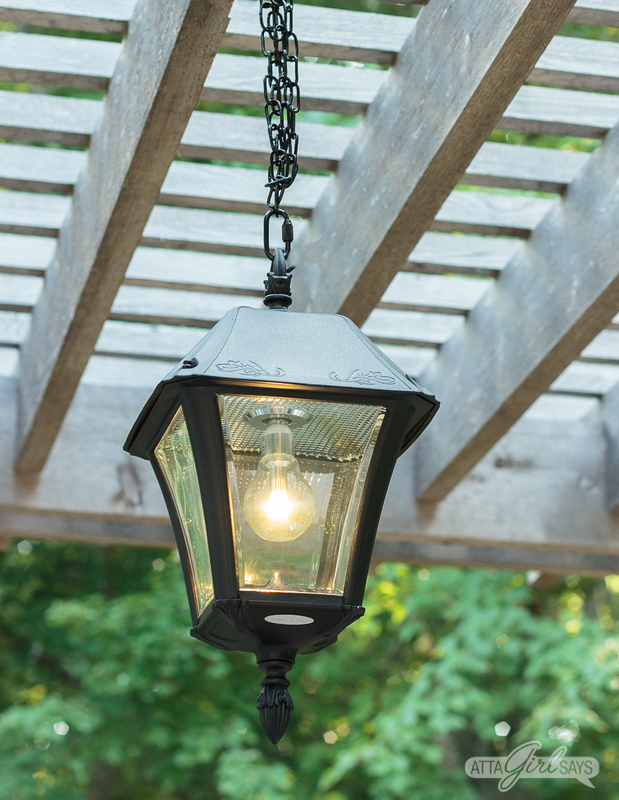 Learn how to install an outdoor solar chandelier pendant light in your pergola, gazebo or porch in less than an hour. No electrician or wiring required! 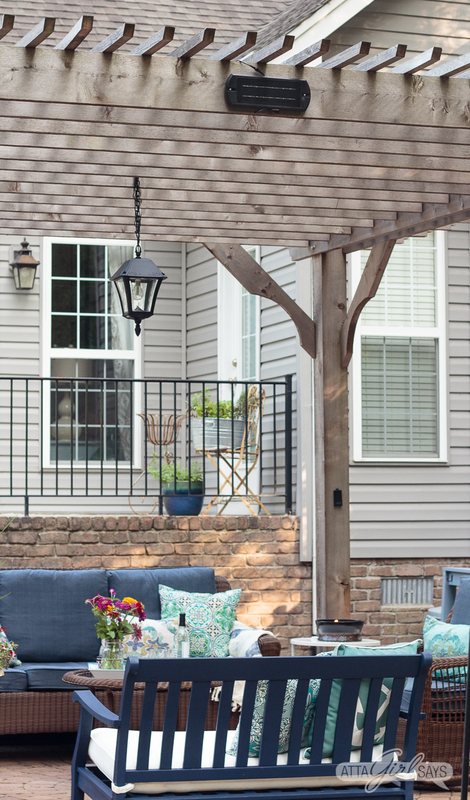 When we were designing our patio and pergola, I wanted it to feel and function like another room in our house. Cozy, inviting and comfortable — a place to start the day with a cup of coffee or end it with a glass of wine or a cocktail. A place to dine, relax, entertain and even nap! 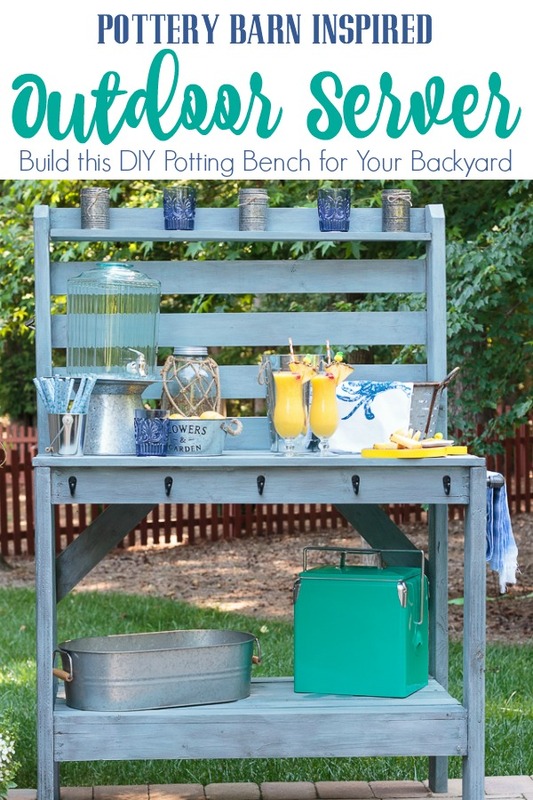 Thanks to a lot of DIY projects, like the potting bench buffet server we built and patio furniture we recently revamped, and some ongoing landscaping, it is the space that I envisioned. And we spend lots of time out there with family and friends. But come nightfall, we always head back inside. Until recently, we didn’t have adequate outdoor lighting in our pergola and patio space. But we recently installed a gorgeous outdoor solar chandelier pendant light from Gama Sonic in the pergola. It’s really transformed the space and allowed us to enjoy our outdoor room well into the evening. Outdoor lighting has been on our wishlist for a while now. I didn’t want to run string lights from the pergola because I knew the cords would be a tripping hazard. And having an electrician install landscape lighting was not in our budget. We’d tried some battery-operated lanterns and a battery-operated candelabra in the pergola, but they never put out much light. And anytime it would rain, they would fill up with water — until they eventually stopped working altogether. The Baytown II Bulb Solar Hanging Light GS-105B-CX from Gama Sonic is powered by the sun and uses their latest patented solar technology — the GS solar LED light bulb — to illuminate our outdoor room. This solar hanging light has a low and a high setting, depending on how much light we need. On the low setting the light can shine for up to 12 hours each night! If only our lights inside worked by remote! If you’re looking for outdoor lighting and landscape lighting, you definitely want to check out Gama Sonic. The company offers high-quality solar pendant lights for pergolas, gazebos and porches; solar lamp posts; solar garden lights; solar path lights with planters; solar security and shed lights; and solar accent lights in a variety of styles. They even have solar tealight candles. 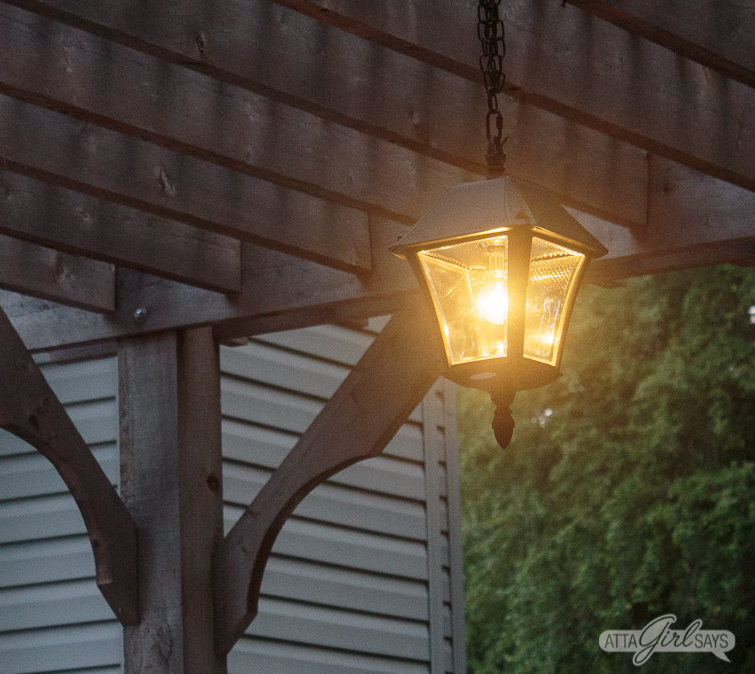 Let me show you how easy this outdoor solar chandelier pendant light was to install. 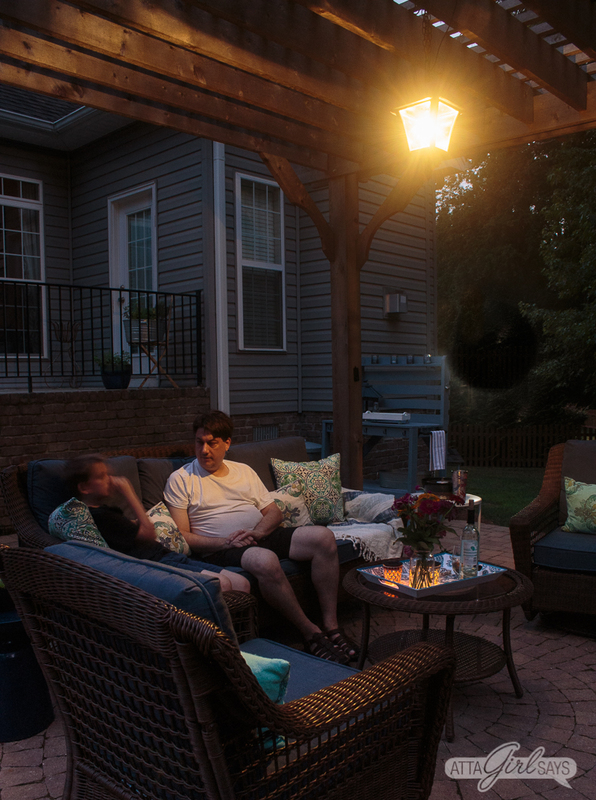 My husband and I took advantage of a recent cooler summer evening to install the Baytown II Bulb light in our pergola. The assembly of the light and installation took less than an hour — even with breaks for photography and video. 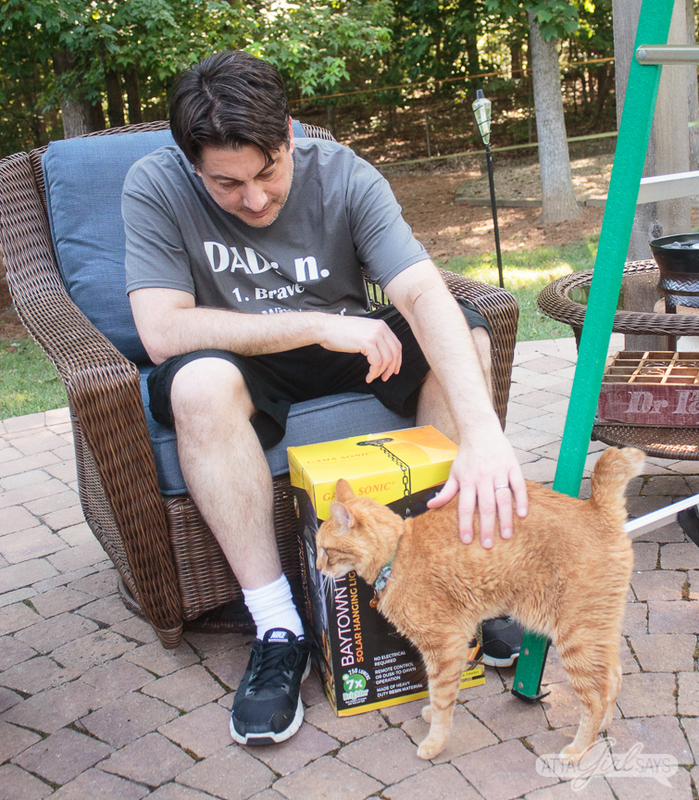 And it was very easy to install — no electrical skills or specialized DIY skills required. You’ll need a drill, a screwdriver and a ladder. A helper also comes in handy. The neighbor’s cat, Ollie, likes to visit us in the evenings. And he was very interested in what was inside the Gama Sonic box. To begin with, you’ll need to add the decorative finial to the bottom of the pendant light, then assemble the lantern using a screwdriver and the hardware provided in the box. 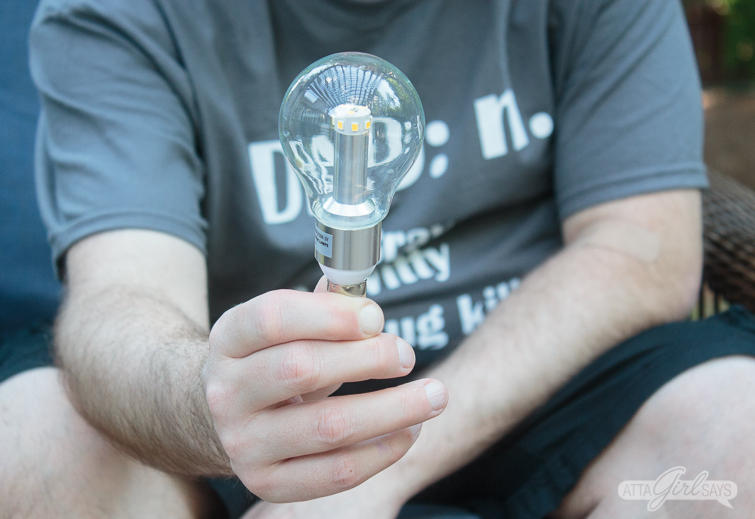 After you add the reflective lens to the lamp base, as shown in the video, you can install the Gama Sonic Solar LED bulb. Be sure to handle the bulb only by the base, not the glass. 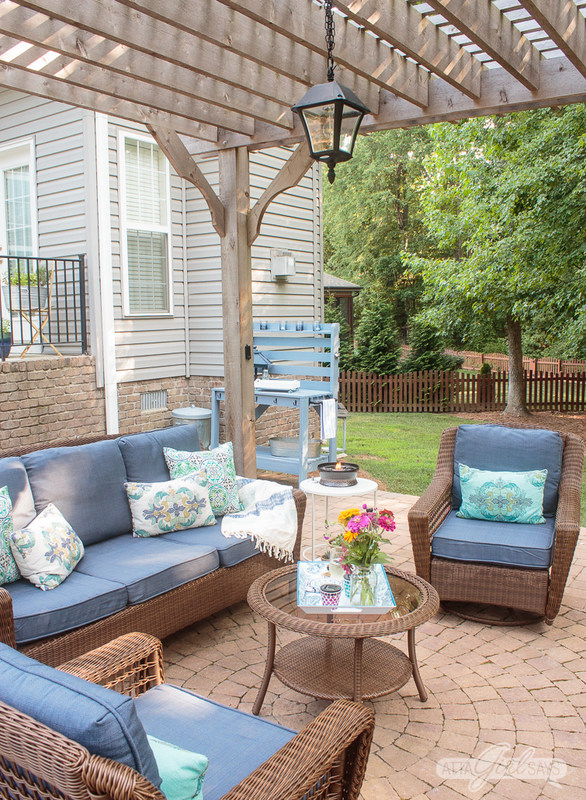 Once the outdoor solar chandelier pendant light was assembled, my husband installed the mounting hardware and hung the light in the center of the pergola. 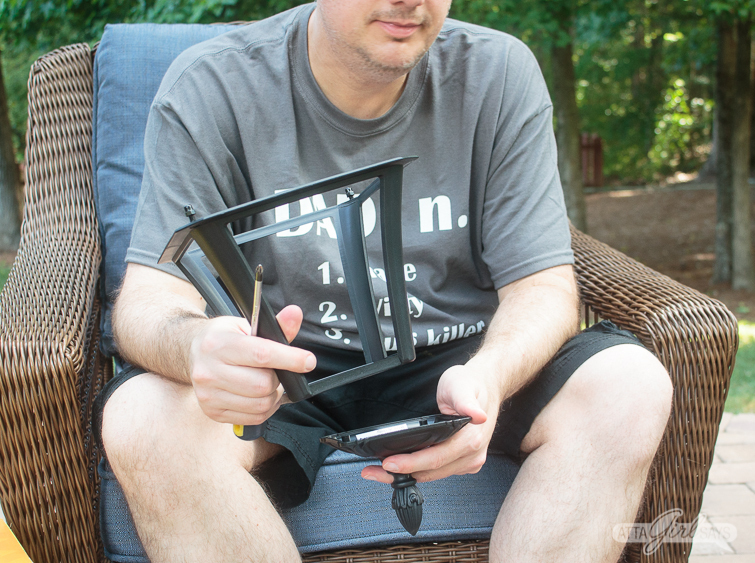 As you saw in the video, he used tape to hold the mounting hardware in place while he was installing it so he had both hands free to use the drill. 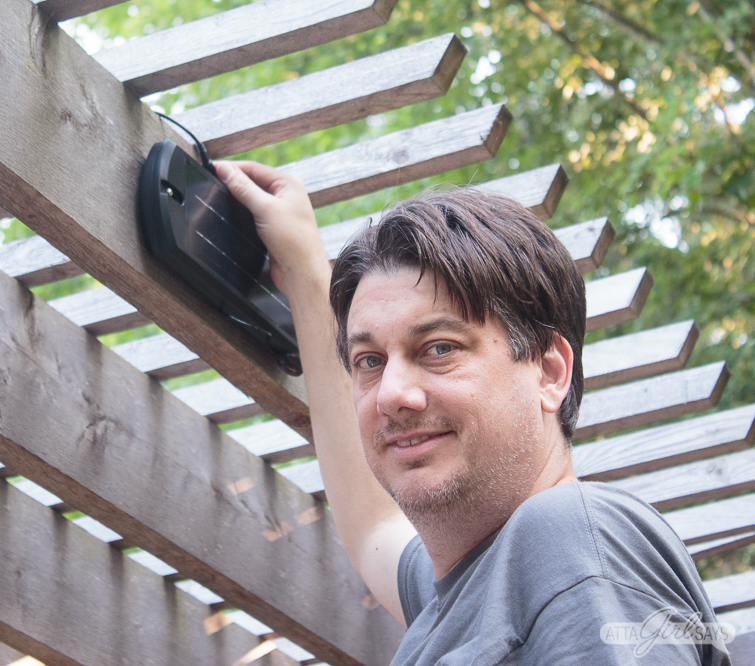 You’re going to want to drill pilot holes before installing the mounting hardware with the screws provided, especially if you’re mounting on a surface like a cedar pergola. Next, my husband installed the solar panel on the pergola, in direct sunlight. As this outdoor light is strictly solar powered, it’s imperative to install the solar panel in direct sunlight. 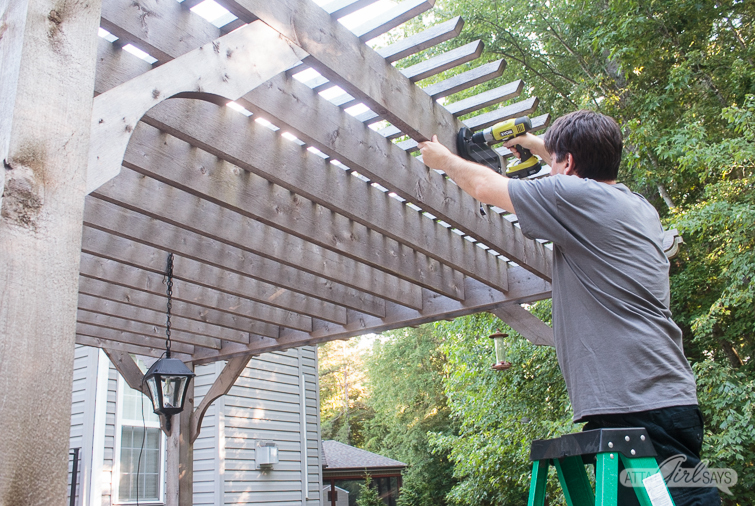 Our pergola is 10 feet tall, and our ladder wasn’t tall enough for my husband to climb on top of it to install the solar panel. So we put it on one of the outside slats where it gets direct sunlight throughout the day. 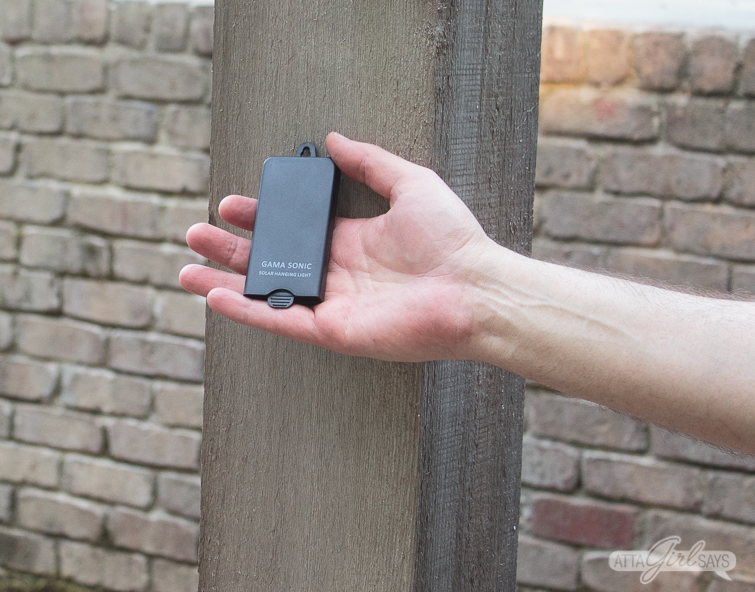 We’ve had absolutely no issues with our light charging in this position, since it gets a lot of light. 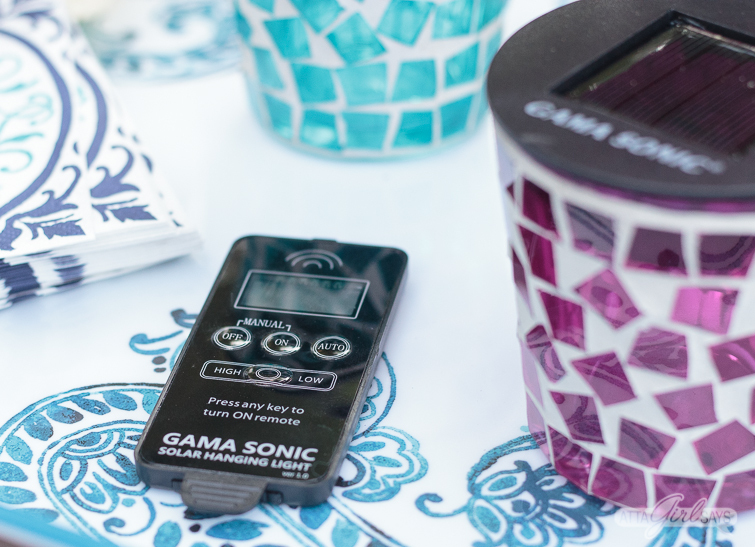 However, Gama Sonic highly recommends installing the solar panel at the top of a pergola or gazebo in order to assure that it is harnessing maximum sunlight. So, we will probably move ours as soon as we can borrow a taller ladder. Here’s a view of the backside of the pergola, with the light and solar panel installed. I love how the style of Baytown II coordinates with our existing porch lights. 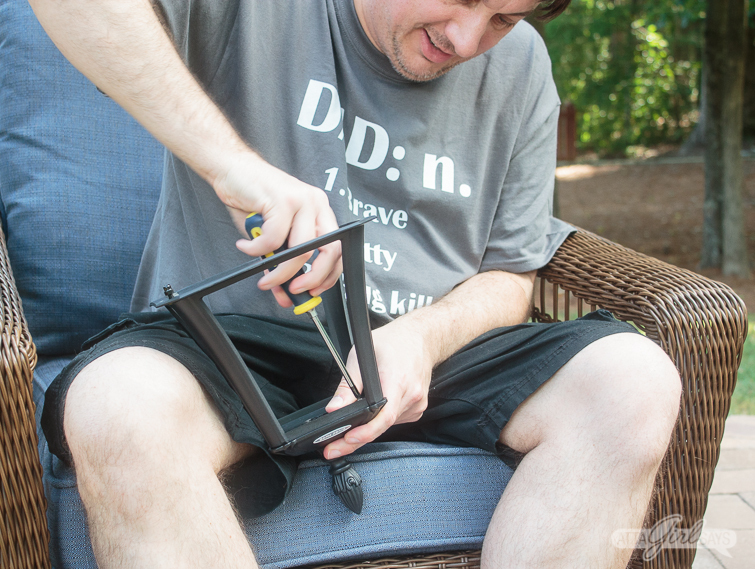 The final step in the process is installing the wall-mounted remote control case, which keeps it protected from the elements but handy when you need it. Not a bad way to spend a summer evening! I actually made a short video showing the installation process. You can watch it below and also check out the step-by-step photos of the installation. 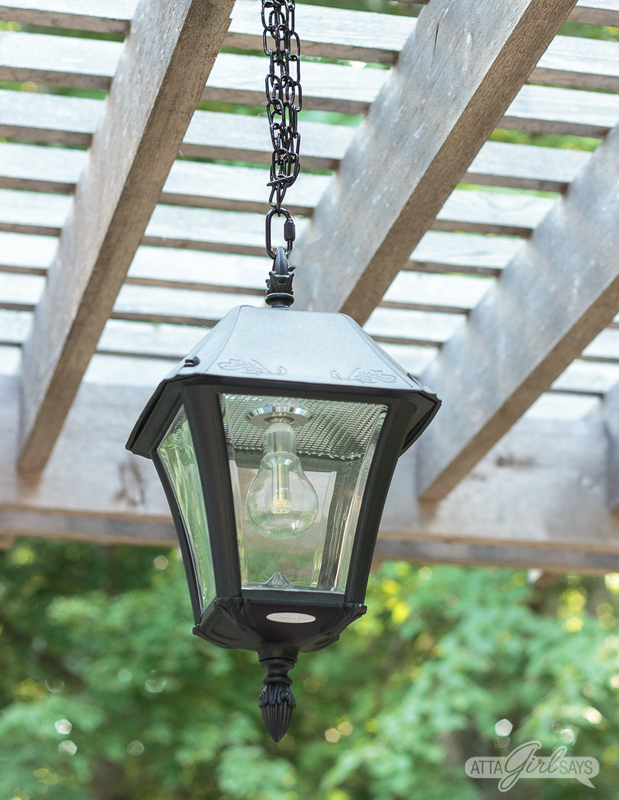 Don’t forget to pin this post so you can access these instructions for how to install your own outdoor solar chandelier pendant light in your pergola, patio or gazebo. I like the solar path light with the planter! Aren’t those the coolest? Such a clever idea. i really like the Candela Solar Lamp Post with GS Solar LED Light Bulb – GS-54B-S. it is really nice. I agree! So many pretty options in a variety of styles. It’s hard to choose a favorite. Great choice. Are you getting lots of good things from your garden this summer? I love that one, too. Such a pretty, traditional, classic option. 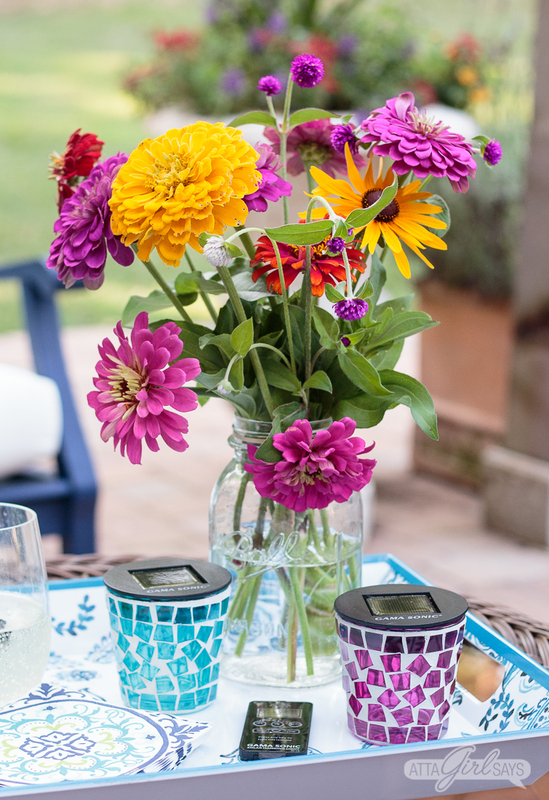 These are just perfect for your outdoor area – I love the idea of the solar lights since they are so much easier, usually, to install. 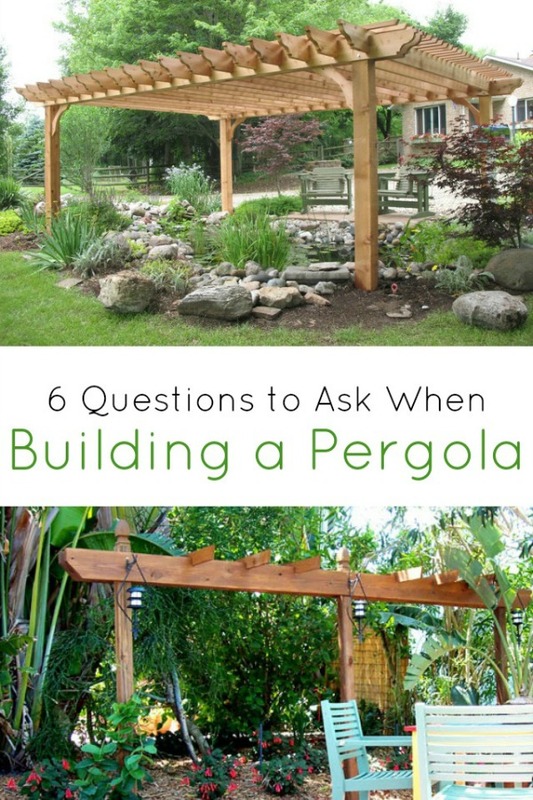 Your pergola is beautiful and these just add so much to it. I’m getting ready to redo a patio and would love solar lights. What a great idea to use a solar light on your pergola. Sometimes it’s so hard if there is no power nearby, and extension cords on the ground always look so messy. I love the Victorian Bulb – Double Downward Hanging Solar Lamp, it looks like one of those lamps you see all through Disney. That was exactly our dilemma. We would have had to run wiring to the pergola underground, which I’m sure would have been expensive. Or we would have had to use extension cords, and there’s really no convenient outlet near our patio. And you are so right about those Victorian bulbs. They are very Disney-esque! Love this! So very cool! Good luck. Fingers crossed for you. Bruce looks like he had fun 🙂 Love the pendant light and your outdoor space looks amazing! He did! He’s becoming quite the blog model! 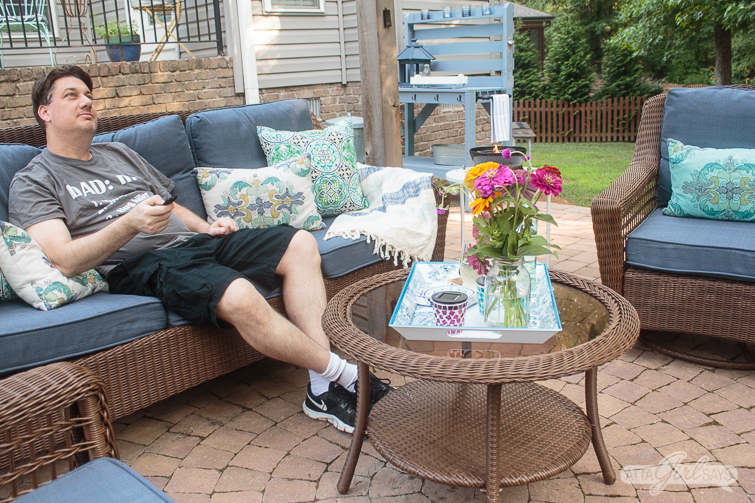 And when you’re feeling better, you can come over to hang out on the patio. 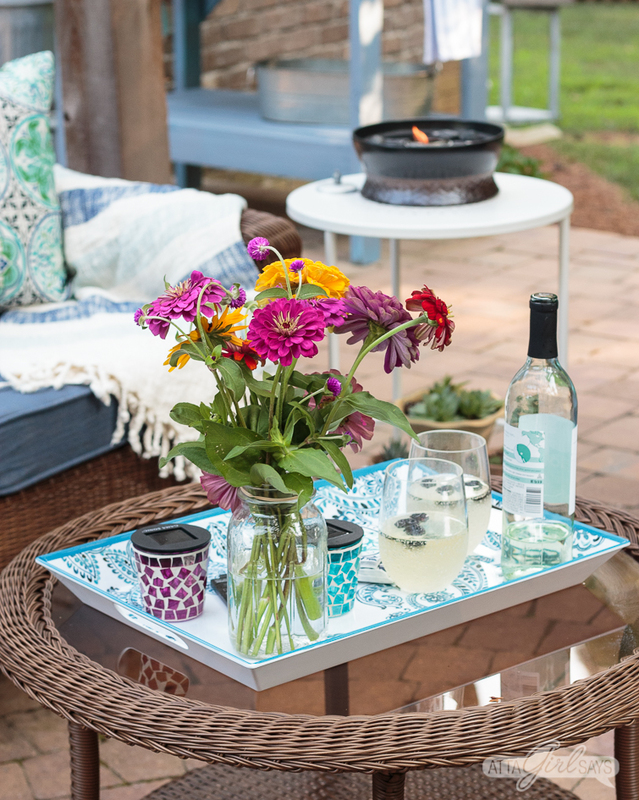 The light and candle votives are great additions to your beautiful outdoor space!! Thank you so much. We’re really pleased with them. Thanks for the chance to win that beautiful light. So much better than electric which you could forget to turn off (me) ha! Love you patio, so pretty. So true. I love having these solar lights on our patio. It’s really increased our enjoyment of the space. I need the Victorian double lamp post for our front yard. So cool! I adore solar lights. Thanks for the tutorial! I’m in love with the Victorian Double Hang Bulb lamp post – so gorgeous and wonderful for my front walk! Although I really love the solar chandelier you are featuring! That Victorian style light is one of my favorites, too! cute installer 😉 . I need that light! Love the way this looks! We just put up a gazebo in our backyard and this light would be perfect! This light would work great in a gazebo. I like the Pagoda Solar Lamp Series – Double Lamp Post GS-104D! 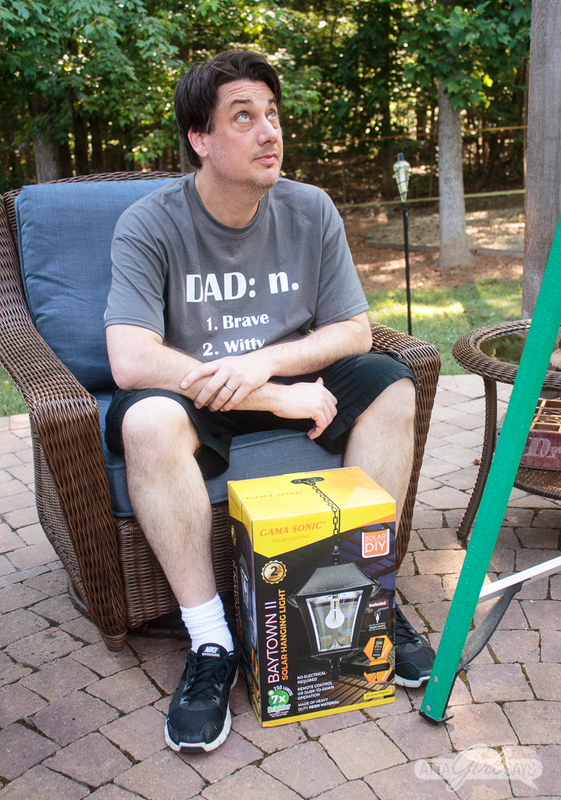 I like the Regal Solar Lamp. It closely matches the other lamp posts in my neighborhood. My favorite item is the Victorian Bulb – Double Downward Hanging Solar Lamp Post GS-94B-CD. It is so pretty. I really like the Flora Series – 3″ Fitter GS-113F. I would love the Victorian Bulb – Double Downward Hanging Solar Lamp Post for my walkway. My favorite item is the Imperial Bulb Solar Lamp and Single Lamp Post with GS Solar LED Light Bulb GS-97B-S. I really like the Victorian Bulb Double Downward Hanging Solar Lamp Post. So classy and elegant! Like the stainless steel bollard solar lamps. Love the double victorian light. I like the Plantern Solar Path Light with Planter because it would look great in my backyard. I think that planter is such a great idea. I love a product that does double duty. 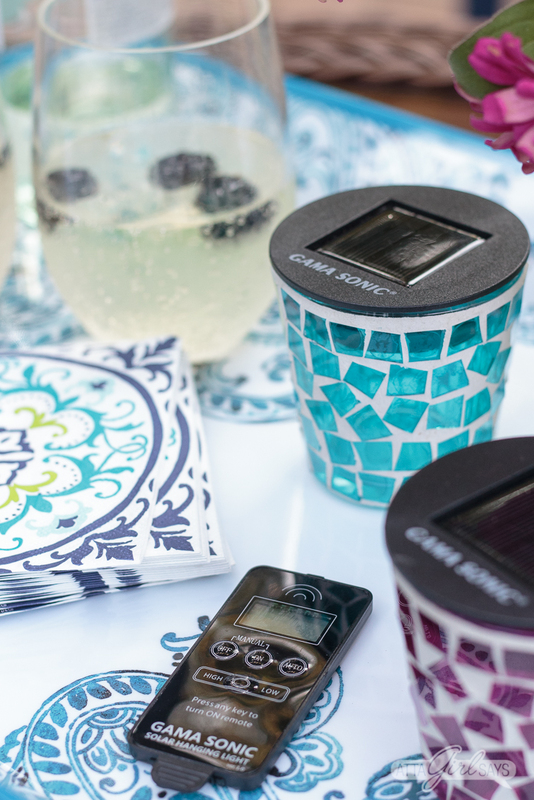 I love solar powered lights and these are so beautiful you would never think that they were solar powered. That is awesome. I love their double downward hanging solar lamp post. They are gorgeous. They are such high quality, and the designs are so high-end. I love the double royal ball with lamp post. It’s so nice. Ooh, that is a nice one! I like the Victorian Bulb – Double Downward Hanging Solar Lamp Post GS-94B-CD. Just so beautiful! I like the Victorian lighting. I love their products but I like the Baytown II Bulb Solar Hanging Light GS-105B-CX best. I like The Victorian Bulb – Double Downward Hanging Solar Lamp Post GS-94B-CD.